Often romanticized in print and on the silver screen, real-life pirates were a brutal menace that plagued the high seas. 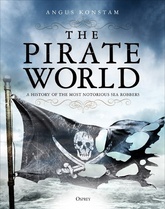 In The Pirate World, Angus Konstam separates myth from reality, tracing the history of piracy through the centuries, from the pirates who plagued the Ancient Egyptians to the Viking raids and on to the era of privateers. He delves into the so-called “Golden Age of Piracy,” and introduces us to such colorful characters as Blackbeard and Captain Kidd. And he explores the West’s initial encounters with Eastern pirates off the Chinese coast, as well as the phenomenon of the modern pirate. Highly illustrated with color images and specially commissioned maps throughout, this is a unique exploration of the pirate world.